My family is a huge fan of road trips! At least once a year, my parents crammed us kids into the back of our minivan and took us on 110km/hour tour of North America. It was a time of granola bars, singalongs, and the creation of way too many inside jokes. But, while road trips can be a lot of fun, traveling with IBS can be really stressful. If you break into a cold sweat at the thought of being in a car for more than 10 minutes, these ideas can help. 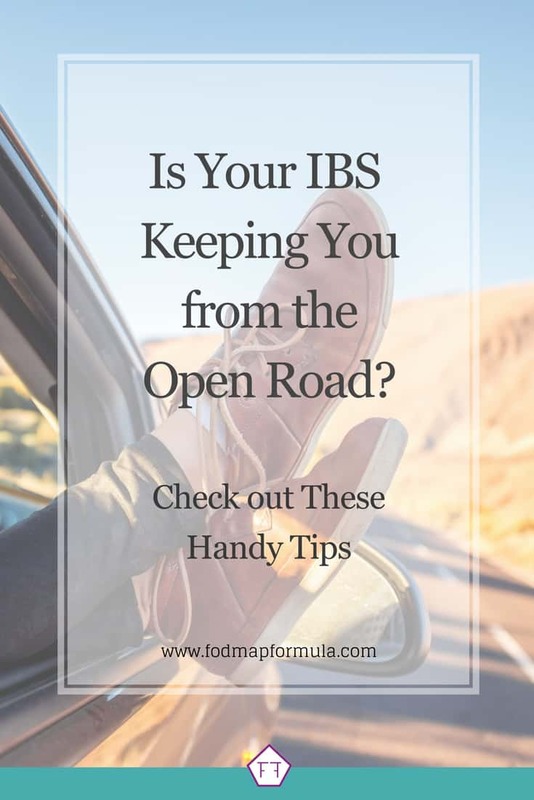 From options on keeping your stress in check to road-side symptom management, here are 5 tips to survive a road trip with IBS. If you’re traveling in the summer, try to stay as cool as possible. Feeling too hot can cause the smooth muscles of the intestines to cramp. This may lead to intestinal pain and diarrhea (which are even less fun than usual when you’re trapped in a car). If your vehicle has air conditioning, keep it at a comfortable level and sit where it can reach you. If not, try a handheld misting fan or wearing a moist running buff to keep you cool as a cucumber. Traveling in the fall or winter? Try dressing in several light layers so you can manage your temperature throughout your trip. Singing the “Hot In Herre” song while removing layers is optional, but highly encouraged. Pick your travel clothes carefully. That super cute sundress will look great at the beach, but you’ll be sitting in the car for a while before you get there. Instead, try loose-fitting clothes in light, breathable fabrics so you (and your tummy) have room to be comfortable. You should also bring a second set of clothes in case of an emergency. They’re handy if you do experience symptoms and knowing you have them can help manage stress-related symptoms. If your emergencies lean more toward the bloating side of the spectrum, make sure your spare set of clothes have a little extra breathing room in case you need to swap them. You can’t have a road trip without snacks! It’s a rule. You can Google it. But, you need to make sure your food choices keep your taste buds and your tummy happy. Look for snacks and drinks that travel well and make sure you test them out a few days before you hit the road. If you need some low FODMAP snack ideas, check out these snack recipes for some inspiration. You should also bring extra food and water in case you get stuck in traffic or get a major case of the munchies. That way you won’t need to choose between being hungry and possible symptoms from random roadside grub. It’s also important to remember that some people experience symptoms over 24 hours after eating a trigger food. So, if you know you’re going to be in the car for a while, make sure you stick to safe foods leading up to your road trip as well. Road trips can be a great way to relax. But traffic, wrong turns, and rising tensions can be stressful. Since stress is a common IBS trigger, it’s important to build in breaks to stretch your body, go pee, and enjoy a little space. One of the easiest ways to build in your breaks is to plan where you’ll stop in advance. One of the easiest ways to do this is to pick out coffee shops and rest stops ahead of time and add them to your route. Aim for a break every 60-90 minutes to check in with your body and manage any symptoms before they get on a roll. If you’re using Google Maps or Waze to plan your trip, use the “search nearby” feature to pick rest stops along your route. Add them as stops to your trip so you know how long it is until your next break if symptoms are creeping up on you. For my friends in the US, there’s a free app called “Trucker Path” that shows truck stops and rest areas along the highway. Technically the information is for truck drivers. But it will help you keep track of the bathrooms on your route (which can help with bathroom separation anxiety). Fingers crossed they’ll expand their services to Canada and other countries soon. Sometimes the easiest way to stop worrying about an emergency is to plan for it. So, pack your emergency kit carefully so you can sit back and relax; knowing you’re covered if symptoms hit. Remember to pack a fresh kit for each trip so you know you have everything you need and never leave medications in the car. A sealable bag to put any soiled clothes in. Road trips are a great way to meet new people and make life-long memories. But, for people with IBS, they can also be really stressful. To set yourself up for success, remember to keep yourself comfortable, plan out your snacks and your breaks, and to prepare for emergencies so you don’t need to worry about them unless they happen. See you on the open road! If you like this article, subscribe to my mailing list below. You’ll get new articles and low FODMAP recipes delivered right to your inbox. You can also follow me on Facebook for access to more articles and research on IBS and the low FODMAP program. Together we’ll get the Low FODMAP Diet down to a science!